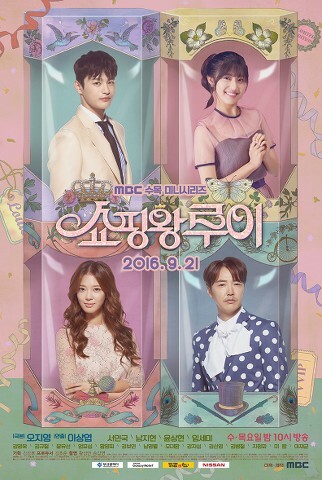 Shopping King Louis is a 16 episodes korean drama that aired in 2016 on MBC. It was written by Oh Ji Young and directed by Lee Sang Yeob. It stars Seo In Guk, Nam Ji Hyun, Yoon Sang Hyun and In Se Mi, amongst others. If you couldn’t listen to it entirely because of how many times the word “love” is sang, then this post might not be for you, your heart is probably two sizes too small. If, however, you loved the song as much as I do, or at least if your skin didn’t crawl because of all the “love love love”, then, please, read on. Beside OdaJoe’s existence, what are you the most thankful for? What are the things that make you feel “rich”? If you were to ask this drama’s lead, Louis, his answer would be “people”. Although, at the start, he is also actually rich, as in “he has money… a lot of it”. But then there’s a car accident in episode 1, he loses his memory, and ends up living with Bok Sil, a young woman that recently came to Seoul to look for her estranged brother after their grandmother, who raised them, passed away. She has no money, no possessions, but has the largest heart, and takes him in. So now, Louis isn’t rich anymore… at least money-wise.